In reviewing Howard University’s proposed campus plan, we started to take account of all of the property in DC that the university owns. Up until 10 years ago, Howard University was accused of being LeDroit Park’s biggest slumlord, owning numerous properties in the neighborhood and letting them lie vacant, blighted, and decaying. 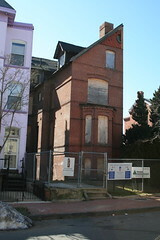 Under the reign of university president H. Patrick Swygert, Howard made a significant and commendable effort to rehab and sell many of its vacant properties in the neighborhood. For instance, the university owned all but one house on 400 block of Oakdale Place. It let these houses lie vacant, blighted, and boarded up. Under Pres. Swygert, the university renovated the houses and sold them to employees. Today the 400 block of Oakdale Place is fully occupied and a new condo building is nearing completion on the western end. 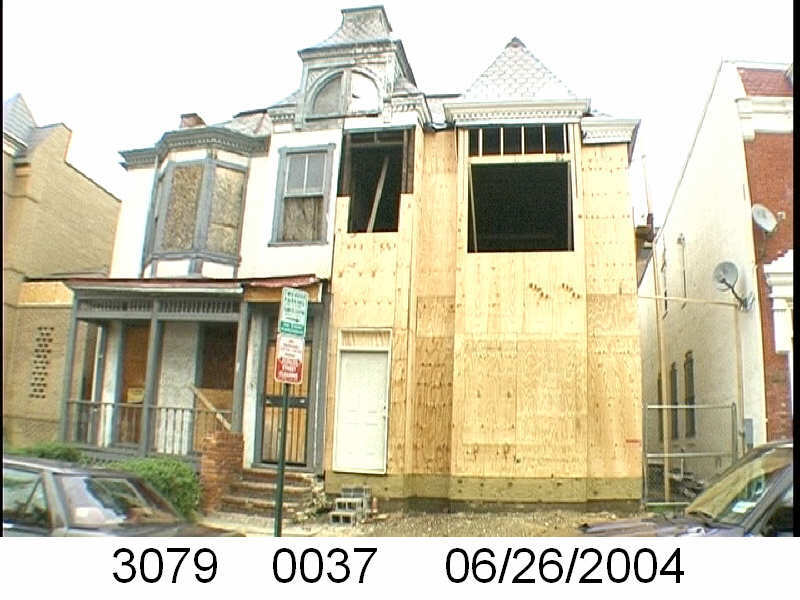 531 & 533 U St NW in 2004. Howard University renovated 531 (right) in 2004. Image from the DC government. In other cases, the university renovated properties but has retained ownership. 531 U Street NW looked terrible in 2004 (right), but now looks very nice. We can’t quite tell if the house is occupied, but it consistently appears to be in good condition. Elsewhere on the 500 and 600 blocks of U Street, Howard built historic infill houses (below) on vacant lots it owned on the north side of the street. The result is a block with with a continuous wall of housing on the street’s northern face. 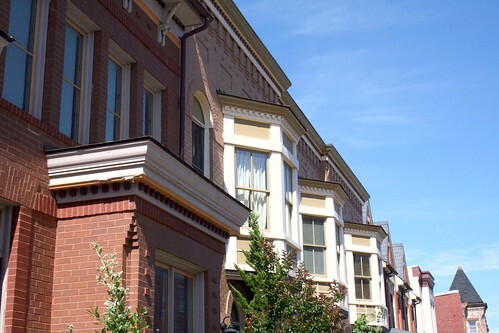 The houses’ façades are of high quality, with detailed brick work, ornate porches, and a variety of detailing. 649 Florida Avenue (left) sits as a vacant lot, frequently collecting trash and debris. A university official told us that long ago Howard had considered using the lot to create a delightful pedestrian path to the university from the Shaw Metro. That never happened and now the lot sits vacant. 408-410 T Street (center) was the home of Walter Washington, DC’s first elected mayor. The university owns the property, and though it’s not blighted, it may be vacant. With some renovation work, this would make an excellent rental home for a Howard professor or anyone else for that matter. 326 T Street (right) is the Mary Church Terrell House, future home of the Robert and Mary Church Terrell House & LeDroit Park Museum and Cultural Center. Though it’s vacant and undoubtedly meets the District’s definition of blight, we are willing to cut the university more slack in this case since the eventual outcome will be a wonderful addition to the neighborhood. Unfortunately, the campus plan does not specify any additional Howard funding to restore the site. Gravel parking lot at the SE corner of 5th and W Streets. (Square 3072, Lot 818). Campus plan does not mention any change to this lot. 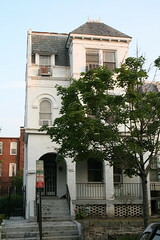 Carver Hall, 211 Elm St NW (Square 3084, Lot 830). Campus plan mentions the dorm’s decommission, but no reuse plans. Slowe Hall, 1919 3rd St NW (Square 3088, Lot 835). Campus plan mentions the dorm’s decommission, but no reuse plans. Though Howard retains a few problematic properties, it’s important to note the great strides the university has made in taking responsibility for its property portfolio in the neighborhood. A plan for these few remaining properties, even one in which the university retains ownership but leases, would put residents at greater ease. L4L, I think it’d be interesting to conduct an informal study to see where Howard graduate students and university students live, whether in DC or elsewhere. I’ve heard rumors that most students and profs prefer to live further NW or up GA ave.